One of the problems with RMAF is that it's just too big. The basic effect of the size is to turn me into that four-year old kid in the ice cream parlor who just can't decide what flavor he wants. This means that some rooms get far too little time for me to write five hundred words about their sound. Don't get me wrong: I can write five hundred words about anything. The problem is that the folks who ran those rooms would know that I was making it all up. I could say that the Teflon Arabesque 5000 offered a deep and holographic soundstage while still managing to thump bass like a Neon Green Honda Civic. The folks who were there, though, would happily pop up to tell you that they had a silent display only, that they're not called Teflon Arabesque, that I'd wandered into their room -- drunk! -- at 4am, and that they still have my pants. The obvious solution is to offer up a few grab-bag posts of short impressions, incomplete information, and stupid jokes. That way, we can keep most of the half-formed insights in one place. I love you guys. I really do. I think you’re awesome. You brought dogs AND ponies to the show. Other people told me that this was a transformative experience. My problem — one I share with many other show goers — is a shortage of time. My other problem — one I share with many other show goers — is the feeling that getting locked into a room for a half an hour of worth of well crafted pitch just smells too much like that time-share cocktail party my third-cousin got suckered into back in 1983. Play music. Swing open the doors and let people in. You’re not selling condos in South Beach. If you have to do canned demos — and some things deserve to be showcased that way! 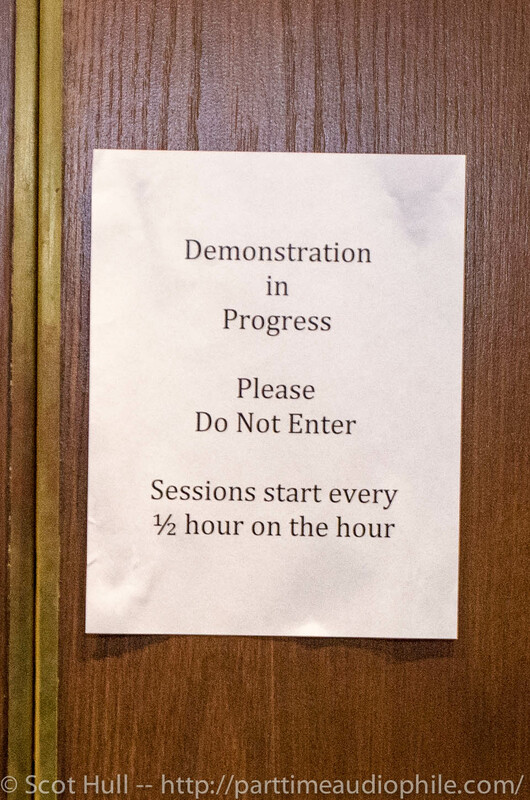 — alternate your closed-door sessions with an open-door policy. Let people walk by and be grabbed by the necessity of hearing your products highlighted the way they’re meant to be. Even the time-share bozos advertised an open bar! The sign on this door didn’t even give that much of a reason to wait around. Despite misgivings, we hung around for about 40 minutes. If the doors opened, we didn’t see it happen. I made the mistake of walking into this room early on Friday. I turned tail and ran. I had no choice. Warren and Tony already had this room on song. Tape was spinning on a restored and modified Otari, a restored and modified Denon turntable sat waiting for records, and everybody had a gleam in their eye. 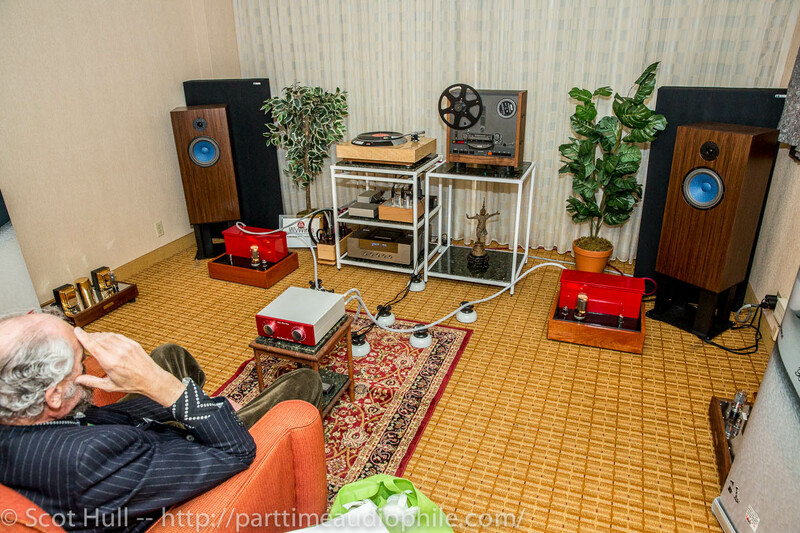 My brief encounter with the sound made it clear that I either had to get out of room or spend a couple of hours here — especially since the big GM-70 amplifiers from Electra-Fidelity had entered production. I knew that sitting down meant that I wouldn’t get up. I still have absolutely no idea how these guys wring that sound out of those Audio Note speakers. I’d meant to go back Sunday afternoon for a good listen. I never got there. Sorry, guys. 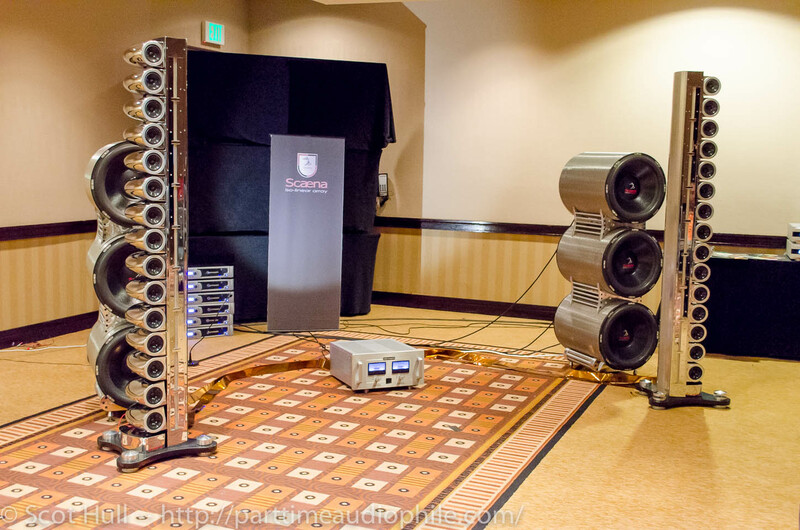 Scaena’s giant bling arrays saw a dCS front end, ARC amplification on the line arrays, and a stack of Crown amps on the sub towers. This room demonstrated conclusively that people are still desperately hungry for an Infinity IRS with halfway decent treble. Jon Monks is bringing the magic of little bits of string to a whole new generation. Taking the basic design of his father’s hallowed record cleaner, the new Keith Monks Discovery One ($3,000) offers a more affordable price. Unlike the previous, Lenco-based generations, this new model is based on a Chinese-import, direct-drive DJ table. It’s relatively quiet, it’s surprisingly fast, and it’s being built right now. This was packed with people every time I walked by. I barely managed to elbow my way in on my third visit. I can’t tell if that’s because everybody is clamoring for room and speaker correction or if it’s just because this room sounded good. Weirdly, though, I’m not sure what to make of the system. 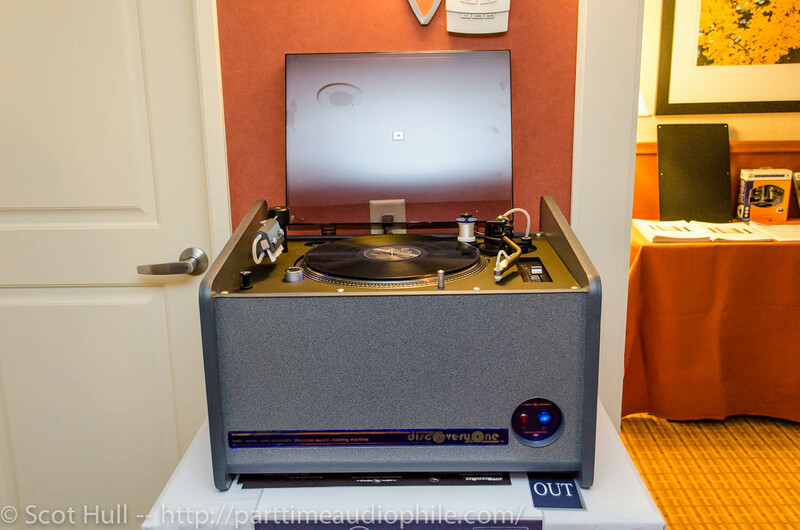 Yes, Ella & Louis sounded pretty enticing spinning on a VPI Scout with a Soundsmith Zephyr, but the Dynavector phono preamp isn’t necessarily what I would have chosen to demonstrate the analog transparency of the DEQX mate to the kind of crowd that buys YG Kipod speakers. 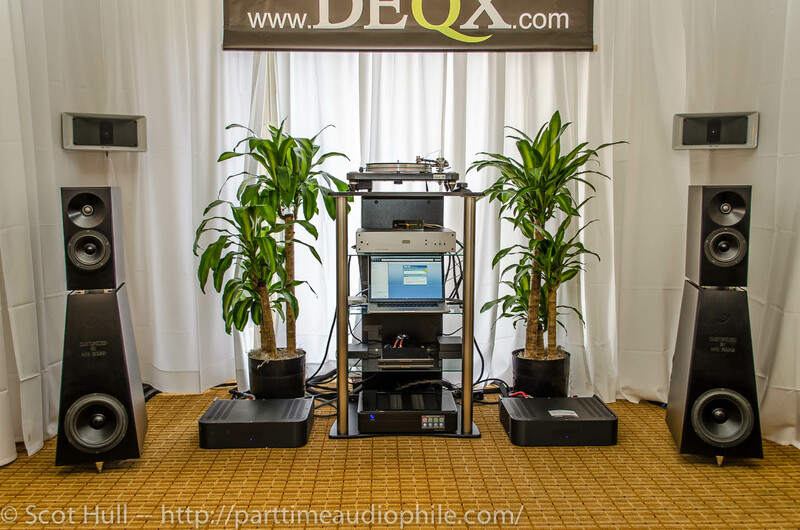 On the other had, it was a fairly conclusive demonstration that the DEQX Mate can indeed serve and benefit an analog front end that has an approachable cost. The Mate costs $4500, or about the same as the whole analog front end here. 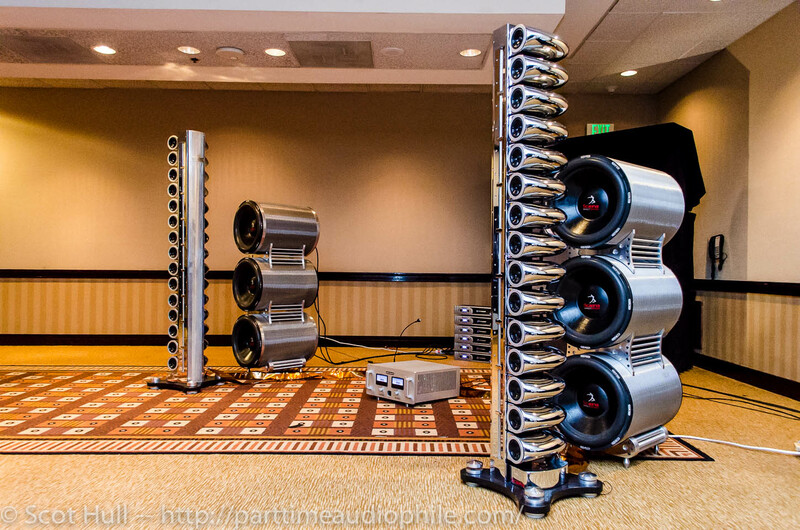 Amps were a pair of Plinius P10 (around $6,000 each), and the speakers were YG Kipods (call it $50k). I would really like to know if having wooden floors as opposed to carpet makes a big difference in sound quality when your spending 25 thousand or more on speakers. Yes. Wood floors make better contact with the upgraded feet on your loudspeakers. It helps. You’ll still want a rug between you and the loudspeakers, but wall-to-wall is not ideal. Does your opinion on wooden floors & speakers also apply to speakers on stands like Sonus Faber ? The only major difference (IMO) between speakers on stands and floor-standing speakers is that, with stands, you have two interfaces to worry about: the speaker and the floor, as well as the speaker and the stand. Both need to be clean and made with good decoupling interfaces. I’ve had the best luck with Stillpoints and Symposium, but both are crazy-expensive. Rubber/sorbothane tends to muddy things (again, IMO). FWIW, I don’t like spikes. You stabilize things, yes, but you convert your speakers (or speakers + stands) into a system that now includes the floor — ie, you’re making things worse, overall, not better. Spikes into cups that are decoupled also works, and you can add something between the cup and the thing below to decouple (at least a little). Herbies makes some really effective tools like this if you’re watching the budget.